Phoenix to Lee’s Ferry is 250 miles, Cousin Bob (Connie’s Cousin) from Page picked us up at the long term parking. Because it was raining the day before & when he picked us up he talked us into staying at his place for the night & giving us a great tour of Page area, we welcomed the idea! 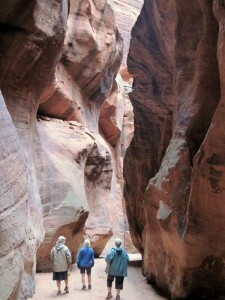 Permits are required for both day hiking and overnight trips in Paria Canyon and Buckskin Gulch. 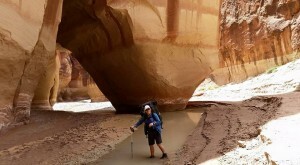 Walk-up permits are available for day hiking at the trailheads, but overnight permits must be obtained through the Paria Canyon online permit application system. Overnight permits can also be obtained in person the day of your hike, IF there are any permits available. The BLM only allows a total of 20 people per day to enter the canyon on overnight permits, and that is across all of the trailheads. An overnight permit is $5 per person per day. Dogs are also allowed for an extra fee of $6 per dog per day. 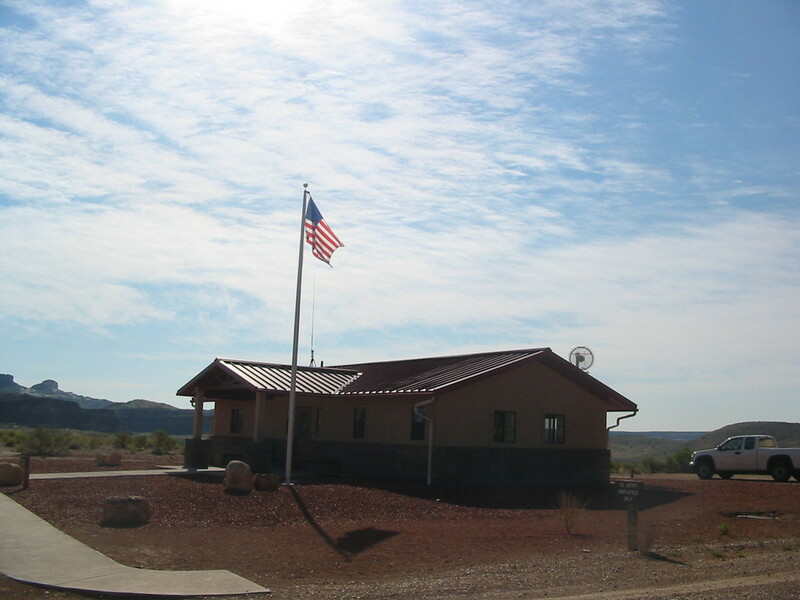 For overnight permits, the reservation system opens up at 12pm Mountain Time on the 1st of every month, 4 months before the month of your hike. Refer to the BLM’s chart below to determine when you need to apply. 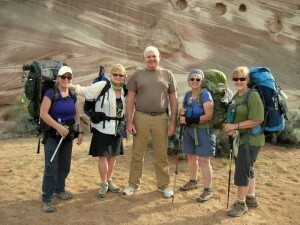 Paria is a challenging, exciting, & beautiful 38 mile hike. 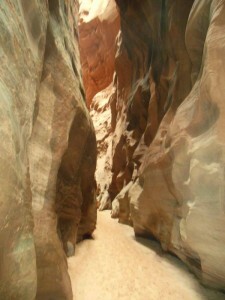 Hiking conditions change in the canyon with the season. In 1993 I hiked same month & week 50% was hiking was in water, this year 95% which meant more quicksand, muck & made it more difficult. 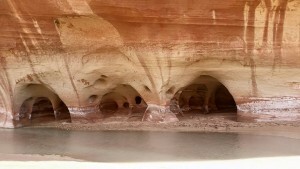 Generally the route through Paria Canyon is river bed itself, however mile 28 has large boulder clog the river which they call boulder slide. Most hikers leave the river at this point & follow a route on the right side of the stream. See my notes coming on day 5. 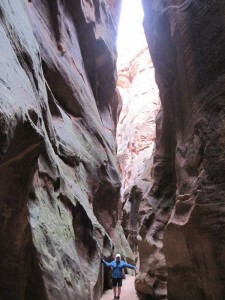 Day 1: Once you start on the White House Trail GO DOWN THE PARIA, not the well maintained trail to the left. The hike was beautiful but from the beginning we were walking in the river.Right before our break I mentioned to watch for quicksand, WELL all I wanted to do was wash off my sandy sock in the creek & yikes up to my knees in quicksand, , Connie jumps into save the day with a cracker in hand & a broken wrist that is trying to heal. She now is in the same boat as I am! 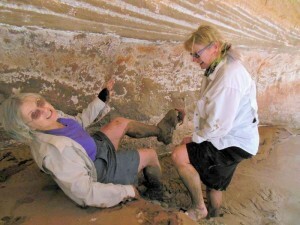 As I try to push her up onto the bank I quickly go up to my thighs.Nancy holds out her hiking pole gets me out now we save Connie. The narrows are beautiful, we made camp near the confluence, set up camp & did an evening trip to the log jam up Buckskin Gulch. We saw one sacred mouse in this cold dark section & wondering what he was doing in there. Day 2: It had rained through the night but had cleared up before day break. The canyon was crisp, clean & clear for the rest of the day, it was extremely scenic, but with rain in the last couple days made the river run higher than normal. It’s always murky, sandy & silty but just more so when has just rained. My GPS & Nancy’s SPOT did not work well in this canyon at all. I never had this happen before but because of it being a narrow canyon I guess it could not get a satellite. So if any one uses either one of these instruments you may need to have other means. Glenda’s Fit Bit seem to work & have close mileage. I never put a lot of faith in it only because I had one & I returned it do to not being correct, but it may have been I never moved my arms like I should had. Big springs was running but keep a close eye out for them. Many of the springs are easy to miss. We filled up here & camped near wooded terrace.This was a beautiful campsite with a huge covert in front of us. 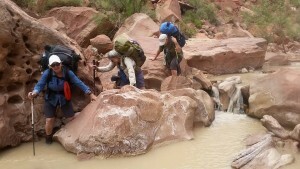 It was large enough to have a least 3 groups of backpackers in the area in still be private. Day 3 Our highlight today besides the scenic canyon was Judd Hollow with the old pump the history that follows that, swallows, wild flowers, & cactus in full bloom. But once again I find my self in what I think is quicksand but it could have been muck, it happened so fast. All I no I was in the middle of Paria I went up to my thighs in whatever & water to my waist, once I yelled out, I put my 2 hiking poles which must of been in a sandbar & it just popped me out. What ever happen I has grateful. Not long after that we come to a narrow & 2 large boulders that makes it very deep & no way around. Of course we are a bit paranoid now since that last incident so out of the blue a solo hiker comes by we tell him we want him to go 1st, he plows right through it like it was nothing of course we follow like little chickadees. Once again we thank the good lord it was nothing major. All this was quite an adrenaline rush! 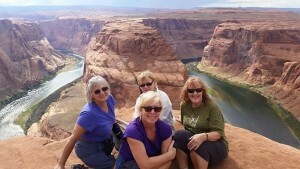 Some how we missed Wrather Canyon with all the excitement I think we were just walking on not paying attention. I did see the arch in 1993, so we will have to come back to see it for the others as it is worth it. We camped at nice site which I felt we were lucky to find a spring or seep that was running well but not on the maps. Day 4 Today the clouds hung around a little longer but was nice hiking. We thought we had most of boulder alley behind us but there was still plenty to overcome, once we got to the last campsite on the map we decided that is where we would make camp. Good thing as we threw down our packs due to rain & wind. A mistake on my part as my Tarptent/ Moment broke a pole in the wind, I should of sat it out & put it in a more sheltered area. Once the 1st gust past I mended the pole with duc tape, then next 50mph wind came all I could do is sit on the tent, all of us had our umbrella’s so that was our shield from the sand blast. Now it was time for our last shot of trail ale! We never got supper as the rain & wind hit again about 6p, we all went to our tents, it rained on & off the rest of the night. Day 5 It was still raining at 8a but we decided to leave anyway, which it did end soon after that. I was looking forward to the trail which was coming up to the right & would by pass boulder slide. This is a remark I found Mile 28, large boulders clog the river, obstructing this way. Most hikers leave the river at this point and follow a route on the right (south) side of the stream where some scrambling through boulders is required. Choosing to follow the river through this section may not be possible during periods of higher water, and requires negotiating a route through many pools and over large boulders. 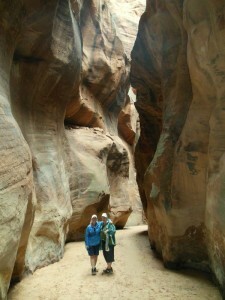 Hiking in the lower canyon consists of traversing long silt terraces or benches with fewer stream crossings. Do not go this way if possible. It was great trail after this, (compared what we had just gone through)we stopped off at Wilson Ranch for a lunch break. I checked out the area, the building is gone, but the corral & old machinery still in the area. There is a spring, water was on the trail but you could not get to it as it was back in a lot of brush & fence line. The gate into Lonely Dell was a welcome sight. 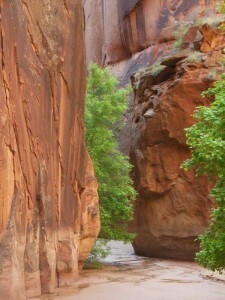 This was a great hike, don’t expect to find much of any trails, Paria River is the trail on much of it. Keep close eye on mileage if you are looking for major springs, bring a filter for a backup, sturdy water shoes would be good, although my old pair of boots worked fine. If you want a major well groom trail this is not the hike for you, if you want solitude, beauty & some adventure go for it!